In 1943, the United States Office of War Information (OWI), in cooperation with The Council on Books in Wartime, and the National Broadcasting Company combined to suggest a Radio program dramatizing some of the more important of these books. 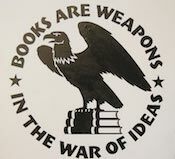 The Council on Books in Wartime was a non-profit organization founded in the Spring of 1942 by booksellers, publishers, librarians, and authors, with the purpose of channeling the use of books as “weapons in the war of ideas,” the Council’s motto. Its stated aims were “the promotion of books to influence the thinking of the American people regarding the war, to build and maintain the will to win, to expose the true nature of the enemy, to disseminate technical information, to provide relaxation and inspiration, and to clarify war aims and problems of peace.” The Council co-operated with the Office of War Information (OWI) and other Government agencies, but was itself a voluntary, unpaid, non-Governmental organization.